The micro-organism requires a base medium for their growth and it is called culture media. Nutrient media contains the substances that are used by organism synthesis of food, growth and survival. It fulfils all the nutritional requirements of the micro-organism. The nutrient media consist of water as the important ingredient plus organic and inorganic components, growth factors, indicator dyes and agar-agar as a solidifying agent. Microbial culture media is basically of two types that is non-living and living media and further, on the basis of ingredients present the culture media are sub-divided. 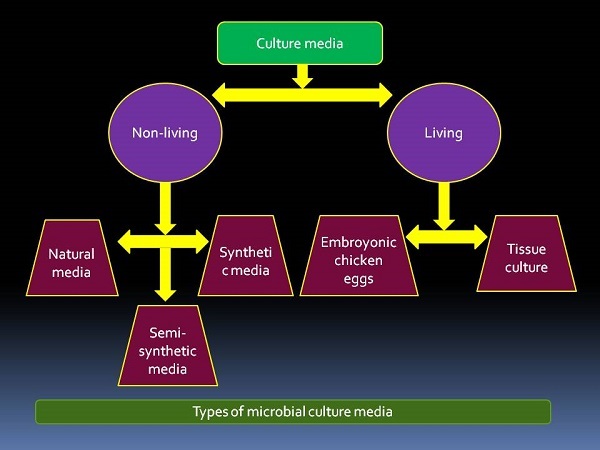 Nature of Microbial culture media is shown in the following figure. 1. Non -Living media components. a ) Natural media – The media that contains natural substances like milk, blood, potato etc are called natural media. b) Semi-synthetic media– The media which composition contains both natural and chemical substances is called as Semi-synthetic media. c) Synthetic Media – The media which contain know the concentration of components is called synthetic media. Synthetic media is further divided into different types on the basis of requirement. 1. Selective media – Selective media contain a component that helps in the growth of a particular micro-organism and suppresses the growth of another micro-organism. Examples of Selective media– MacConkey’s agar, Eosin methylene blue agar, Deoxycholate citrate agar and Wilson and Blair medium etc. 2. Enriched media – It is a media which is able to enhance the growth of particular micro-organism without inhibiting the growth of another microorganism. Examples of Enriched medium – Heart infusion broth, Tryptone soya broth, Blood agar and chocolate agar etc. 3. Enrichment medium – It is normally a liquid medium or broth which increase or permit the growth of given type of organism in comparison of another organism present in the inoculum. 4. Differential media – Differential media contain some components that allow us to distinguish between a different group of bacteria. Examples of Differential media – Blood agar, MacConkey’s agar and Eosin methylene blue agar. a) Embryonic chicken eggs– A live embryo of a chicken egg is used here. It is generally used for cultivation of viruses. b) Tissue culture – The plant cells or animal cells are cultivated on a nutrient media and this cultivated cell line is used for isolation of viruses or some pathogenic micro-organisms. There are many and different varieties of media composition that is used for isolation, cultivation and differentiation of micro-organism. In my upcoming post, you will get the collection of different media composition with role of its important media components.